We’re now running one or two programmes a year, in which we train village women in modern maternity care. We’re tackling two core problems, the sky high infant mortality rates (6%) in the Delta, and the desperate shortage of trained midwives. 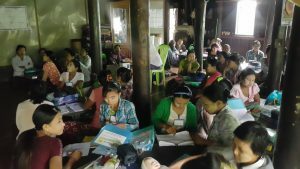 In November 2016 our UK midwives, Frances and Lou, together with our Myanmar health team, trained some 50 locals (including one man!) in our area near Thar Paung in the North Delta. The programme was extremely successful, and we’ll do a refresher for these TBAs, plus training for some new ones, in September 2017. © 2019 Helping the Burmese Delta. All Rights Reserved. Registered charity in England and Wales (No. 1124774). Registered office: 7 Harvard Road, London W4 4EA.